In January 2007, Tom Mullins of the Tyler Economic Development Council suggested that Nick go to Don Proudfoot, Tyler SBDC Director, to receive advice for growing his business. Prior to Nick owning the company, there was not much research into what was burdening the business, but Don was able to determine which factors needed changing. Nick says “Don Proudfoot was a great support system for me and Jen. He knew we were tired and told us to take a breath and focus on the positive. He gave us the confidence to keep going and is the reason we’re still here. He was like a light at the end of the tunnel.” Nick says their biggest difficulty has been keeping up with the growth and acting quickly and effectively to the growth by constantly re-investing in the business. Nick has increased the recognition of the restaurant by being featured in culinary publications and winning cooking competitions. 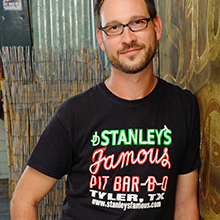 Stanley’s has been listed in Texas Monthly Magazine’s semi-decade issue “Top 50 BBQ Joints in Texas” and has twice won the title of “Best Pork Ribs in Texas” at the magazine’s All-Star Barbecue competitions in Austin. The restaurant has also been featured in books such as David Gelin’s “BBQ Joints: Stories and Secret Recipes from the Barbeque Belt”, and “Where America Eats.” In 2013, Stanley’s was featured in the book “Phophets of Smoked Meat: A Journey Through Texas Barbeque” written by Texas Monthly magazine’s barbeque editor, Daniel Vaughn and published by TV Travel Channel’s Anthony Boudain. Stanley’s popularity and growing fame have been a boon to Tyler’s tourism and Tyler Mayor Barbara Bass, declared November 9, 2011 as Stanley’s Appreciation Day. In July 2011, Tyler was named #5 of the Top 10 Best BBQ Cities by Livability.com, a national website that highlights more than 500 of America’s best places to live and visit. Also in 2011, the restaurant’s big, glowing neon sign was designated a Tyler Historic Landmark. It was the first historic sign in Tyler to receive a marker. The U.S. Department of the Interior says that old signs are worthy of recognition because they reveal the history of a community. Stanley’s Famous Pit Bar-B-Q is one of the oldest operating restaurants in Tyler, Texas. It has been family owned and operated for over 50 years and as Texas Monthly magazine says “is proud to still be a unique “Mom & Pop joint” in the age of franchised and generic eateries.